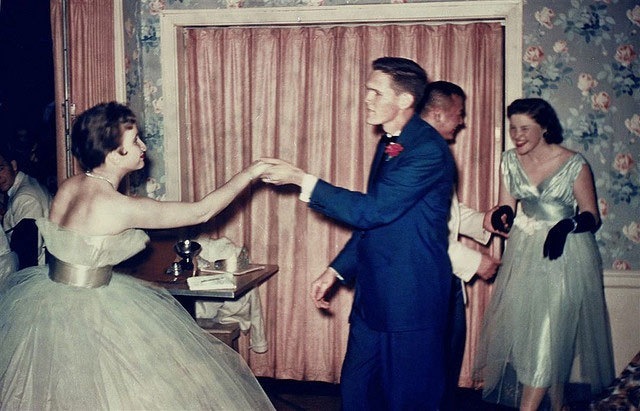 Here at 1950s Glam, we love a good party and we pretty much think that there’s almost never a bad time to throw one. And there’s nothing more fun than adding a little extra pizzazz to your party with a theme. So with that in mind, we thought it was about time that we turn our attention to a little retro themed entertaining. There was a proper etiquette to throwing a party in those days, which is part of what makes 50s style entertaining so appealing in our era of last minute casual gatherings. Perhaps it is all an illusion and there was still someone throwing up in the garden on the way out, but for now, we’ll keep the illusion alive for just that little bit longer. So on to the essential elements of a proper 1950s cocktail party. It all began, first and foremost, with an invitation. Invitations would be sent by mail to the guests who were then expected to RSVP the same way. None of our modern day call or text invites, a proper cocktail party in those days had to be planned well in advance and one of the first tasks was sending out the invites to guests by mail early to allow them enough time to RSVP. Most importantly, sending the invitations out early also allowed you as the host plenty of time to invite more guests if needed and to make any adjustment to the menu or drinks. 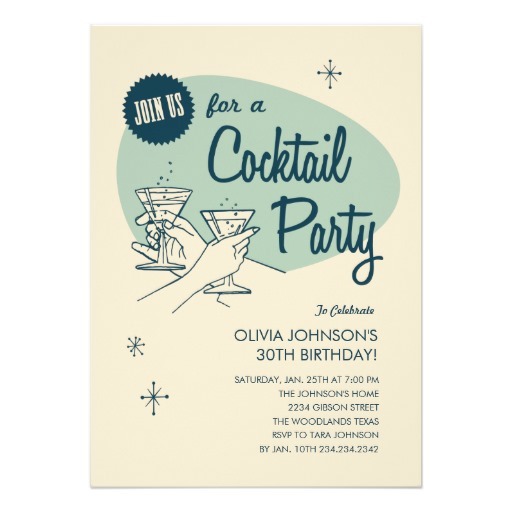 The first step then of hosting a 1950s style cocktail party is to write and mail out invites to all your guests. Don’t forget to include an ‘RSVP by’ date too. But let’s be a bit reasonable here too, times and technology have moved on a bit since the 1950s! Remembering that the majority of women during the 1950s were full time housewives and so had a lot more time to plan that cocktail party than us, modern day gals, we can improvise a little here (many occupations and employers still sacked women on marriage or pregnancy as a matter of policy and less than half of all women of working age were employed in the workforce in 1955). A vintage style ecard sent to your guests by email will do just as nicely and will no doubt delight and surprise as well. Just the thing to set the scene and get everyone in the mood of the theme. Now actual examples of invitations from the period are hard to find. But as an aside, our search for some examples led us to a fascinating social phenomenon of the post war, depression era. 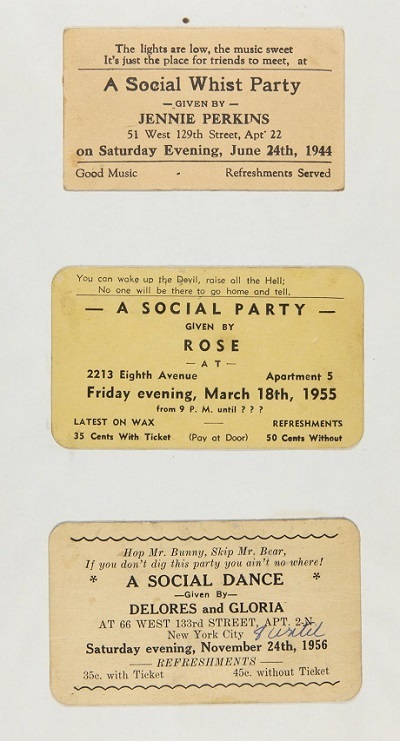 In the African American community in Harlem which suffered from excessive rents charged by unscrupulous landlords, people would throw ‘rent’ parties where they would charge an entry fee to help raise money for their rent. Cards like the examples in this picture would be distributed to all of those invited to attend. You could certainly use these as a model for your own invitations or better still, why not spice up your retro theme even more by making your party a ‘rent’ one! What to wear? 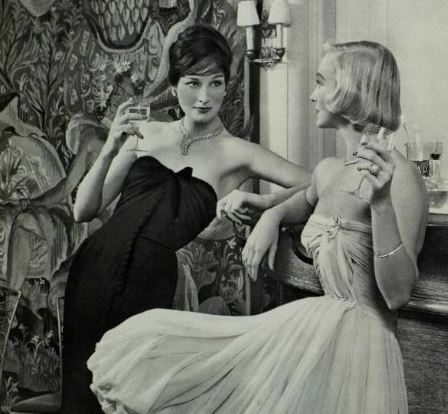 The dress code of a cocktail party in the 1950s of course demanded effort and at least some attempt at elegance by the ladies but also by the men. Women would generally wear evening dresses and the men would wear a suit and tie (occasionally, depending on the type of gathering, this could also be modified to a dinner jacket and tie with dress pants). 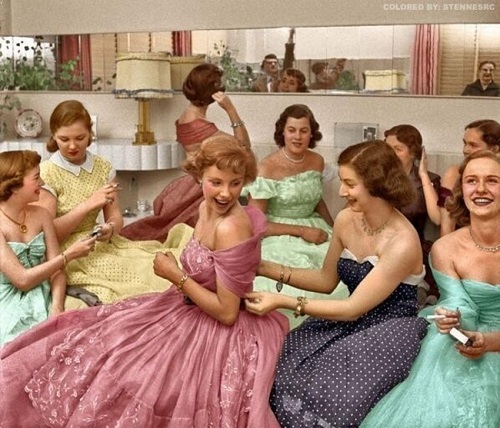 A party was a chance to dress up for the occasion even more than usual, which is something of a feat when one considers how gorgeously groomed women of the 1950s looked on an average day! Apparently Christian Dior himself coined the term ‘cocktail dress’, a dress that was somewhere between everyday wear and ballgowns. As Antiques & The Arts wrote of the new cocktail dress trend: ‘’Celebrating the end of wartime austerity, these dresses emphasized romantic, feminine hourglass silhouettes, full skirts of luxurious, expensive fabric, layers of petticoats and a lengthened hemline. Sloping shoulders, cinched waists, padded hips and a long, rounded back added to its appropriateness for cocktail party viewing from multiple angles”. Now a vintage evening Dior creation might well be the financial equivalent of scaling Everest for most of us but thankfully, with our modern day revival of vintage styling, there are now plenty of stores to choose from, including ours, catering to all tastes and budgets that sell vintage inspired or authentic vintage dresses. What’s more, many of the dress styles of the 1940s, 1950s and 1960s were so classic in styling that you also don’t need to worry about your new dress hanging in your wardrobe unused after the party is over. In our modern day era of the casual, a classically styled dress comes in handy for many an occasion that calls for a more dressed up look. Ask your guests to dress up for the occasion, or, if you feel like that would be too much of an imposition, at least ask them not to wear casual clothes such as jeans, t-shirts or sneakers. 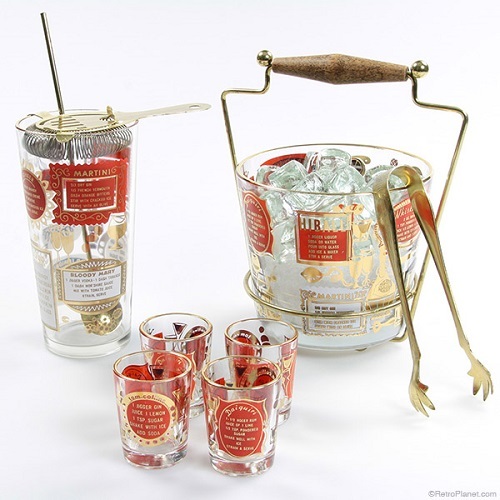 The 1950s was the era of “mother’s little helper”, gin and a time when cocktails were really in vogue. 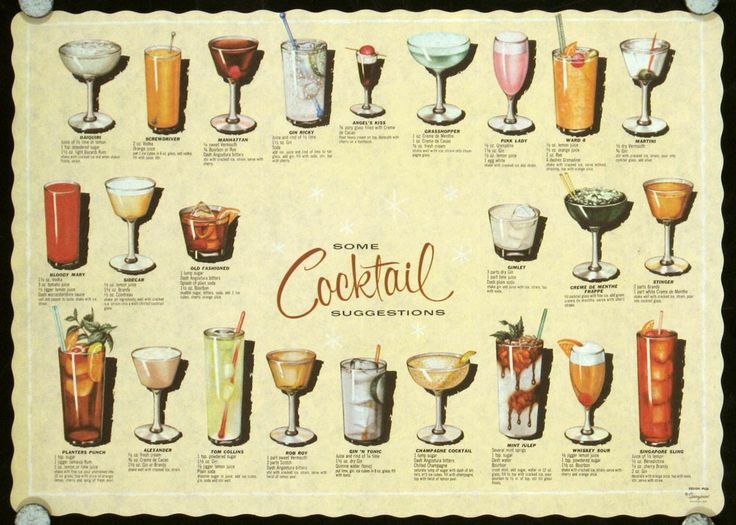 While beer and ale were still served, some of the popular mixed drinks of the time included the Tom Collins, martinis, daiquiris, mint juleps, highballs, side cars, whisky sours, champagne cocktails and most important of all, the punch. The punch was the staple of the 50s cocktail party and there are countless variations which were popular. Many were based on tea as the base ingredient while others were fruit juice based. There are some truly elaborate recipes which survive from the day but here is one easy one which was shared by Amy from Parker Haus Roles. It’s a recipe from her grandmother who used to host many parties in the 50s and 60s. Easy and delicious, this one has stood the test of time. Mix in a large punch bowl. Float frozen strawberries on top when ready to serve. Our thanks for sharing this recipe with us Amy, a real treat! Now, on to the final important detail. 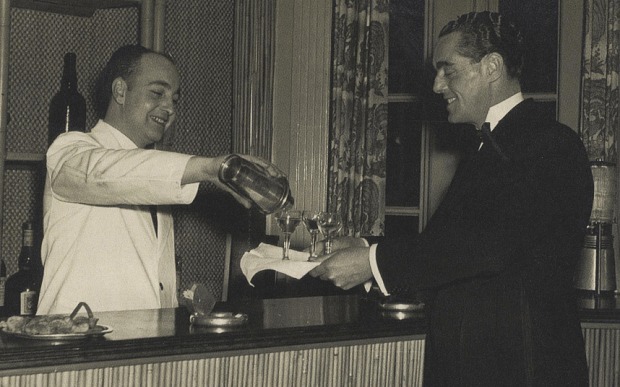 Much like with everything else at the time, there was a proper way to serve drinks at a cocktail party in the 50s. Drinks were generally served to order and mixed away from the guests. Usually the host, a friend or someone hired would take the guest’s order and would make their drink in another room. Guests might only start to serve themselves once the night was well under way and social propriety had been loosed up by alcohol. The important thing about serving the drinks in those days was making sure that you served them in the appropriate glass. Each type of drink had to be served in its own kind of glass. There were cone shaped glasses for serving martinis or manhattans or tall, high ball glasses used for drinks with a higher proportion of non-alcoholic mixer such as the Tom Collins or the mint julep or low ball glasses, which were shorter glasses with a solid bottom, good for muddling ingredients and used for drinks like the gimlet or the old fashioned. And don’t forget the punch, which was served in its own bowl with matching glasses. 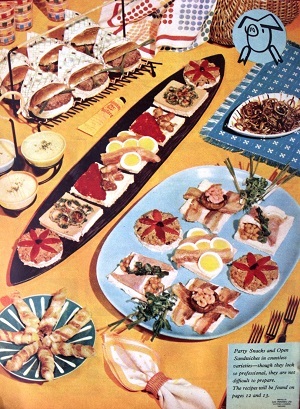 Once rationing lifted and the beginning of processed food and time-saving kitchen gadgets came along, party food started to become more elaborate. Novelty was key. And for dessert, such delights as jelly and marshmellow bars. 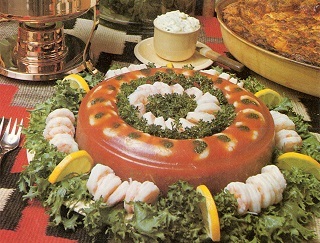 This is just a small selection of some of the party foods that were popular at the time. If you’d like to find out more, the wonderful website foodtimeline.org is an excellent resource of all kinds of food and drinks which were popular during the 1950s, including details on how to serve them. So that’s a 1950s cocktail party in a nutshell. But wait up, we hear you ask, haven’t we forgotten something? The music of course! A theme party just wouldn’t be complete without it! A typical cocktail party of the time might play some Frank Sinatra, Lester Young, Miles Davis or other jazz greats on the hi-fi but of course the 50s are known for much more than just jazz when it came to music. So depending on the theme or mood of your party, choose from classic 1950s rock n roll, rockabilly, jazz or lounge music and program your playlist. Now you’re all set. Have a great time and be sure to let us know how it went!